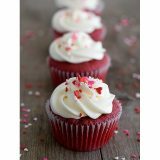 The perfect traditional red velvet cupcake, topped with a marshmallow cream cheese frosting. Blend cream cheese and butter together in a mixing bowl. Add melted marshmallows and sugar and blend. Spread frosting on cooled cupcakes.